1. 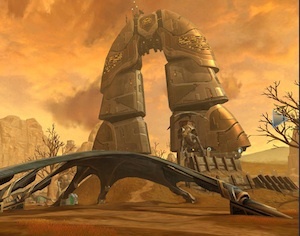 Bioware have announced a new planet that’ll be featuring in SWTOR: Voss. Voss is an independent planet populated by Mystics who are major wielders of The Force, but know nothing of its existence. Sounds rather intriguing. 2. From the official SWTOR forums, there’s some interesting discussions on prestige classes, whether role-playing fansites serve any purpose, and a great introductions thread for Australian and New Zealand SWTOR players. 3. Whilst talking forums, we’ve set up our own. They’re very simple, which concerned us initially but the feedback has been great to date, and there’s already a good community building. 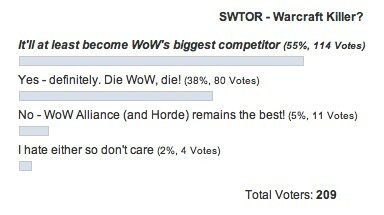 No big surprises there although one has to wonder about the people who voted that they hate either game.